Make the most of the space in your bathroom by using the window sill as a functional feature of the room. Decorating the window sill is an excellent way of utilizing space and adding unique touches to your bathroom. Although it is a small space, details such as color, curtains and arts and crafts can make a significant difference. Doing DIY crafts to fill the area incorporates a bit of your personality into the design, creating a homely feel. Character can be added to your bathroom by decorating the window sill in an aesthetically pleasing and functional way. Curtains are the biggest feature of a bathroom window sill. They come in a wide variety of styles, colors and textures, and have many roles to fill. They need to ensure privacy while allowing natural light into the space. In some cases, curtains may need to provide privacy, so finding a curtain that is easy to open and close would be essential. Sheer curtains are great for this purpose as they cover the window but still allow light to enter the room. The material of your curtains also need to be susceptible to moisture and humidity to ensure that they last long and stay in good condition. Vinyl curtains are durable and able to get wet. This is ideal if bathroom is small or if your window is near a source of water. Panel curtains work well with small windows as they are simple to install and can be easily cut to fit any size and shape. 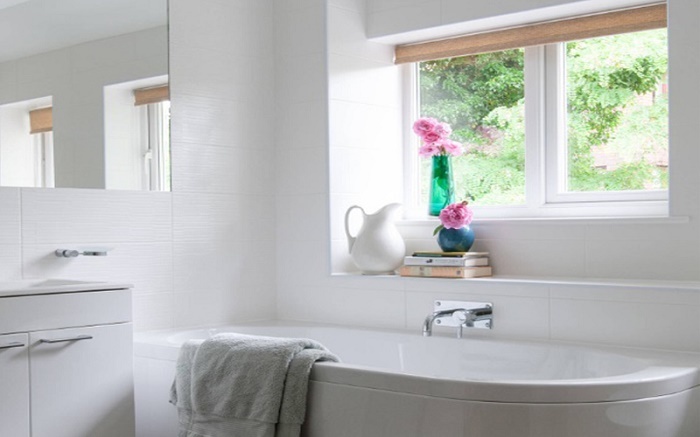 On the other hand, you may have big bathroom windows, which will require a means of covering a section of it for privacy, but also allowing the top half to remain open, allowing for sunlight to enter. Classic hanging curtains allow you to play with style, texture and patterns while still having an open and bright window. If in anyway you dont feel too comfortable with the sunlight, then you can consider window tinting for homes. Plants work great in addition with the right curtain. Window sills place plants in an ideal position for sunlight. When choosing a plant, you should consider its needs in terms of light and moisture and humidity. Small plants that grow long leaves or vines are great alternatives to curtains if privacy is not an issue, as they can frame the window and create a beautiful and natural feel. This is also an opportunity to make use of homemade flower pots or vases. According to ByPurify, plants work well in conjunction with an air purifier for mold to keep the air clean and your bathroom mold-free. Who doesn’t enjoy relaxing in the bathtub under the soft texture of candlelight? Candles are the perfect addition to bathroom décor as they not only look great, but provide some atmospheric lighting. Layer candles of different shapes and sizes to create a tranquil feel. When using candles, be sure that your curtains or other flammable objects won’t get in the way. Create a tissue holder out of a mason jar by cutting a space into the lid. Fill the jar with tissues, and pull them out through the whole. You can decorate the reusable holder as you please. Small DIY touches such as wooden boxes to place candles, homemade soaps or incense is cost-effective and makes the room feel more personal. There is no end to the fun projects you can create at home out of everyday items.